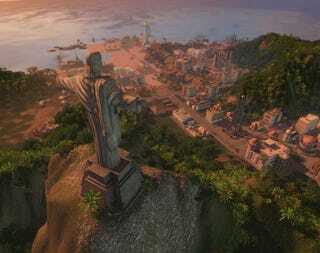 Tropico 3's upcoming expansion pack, Absolute Power, is your license to print money, as long as you keep it in-game. Kalpyso Media's reboot of the classic island nation simulation Tropico last year was quite a success, garnering praise from the hardest of strategy game critics, so it's only natural the game get an expansion. Coming in May, Absolute Power gives players even more ways to lord over their island as a benevolent ruler or oppressive tyrant. Absolute Power will add new buildings, scenery upgrades, and landmarks to the game, along with a new campaign spanning 10 missions, a Loyalist faction that worships the ground you walk on, and new Megalomania edicts that will have your citizens celebrating your rule in the streets - or else! Check out the full feature listing below for a better idea of what to expect when Absolute Power comes to Tropico 3 this May. • 10 new Megalomania edicts - demonstrate your absolute power by ordering the construction of a huge golden statue of Tropico's top export, declaring an annual festival dedicated to yourself or even print your own money! • 6 Landmarks – Build huge decorations and buildings which dominate the island landscape and make each island unique. • New faction - The new Loyalist faction are your die hard supporters and want no elections (since you're obviously the best candidate) and want a statue of you on every corner!